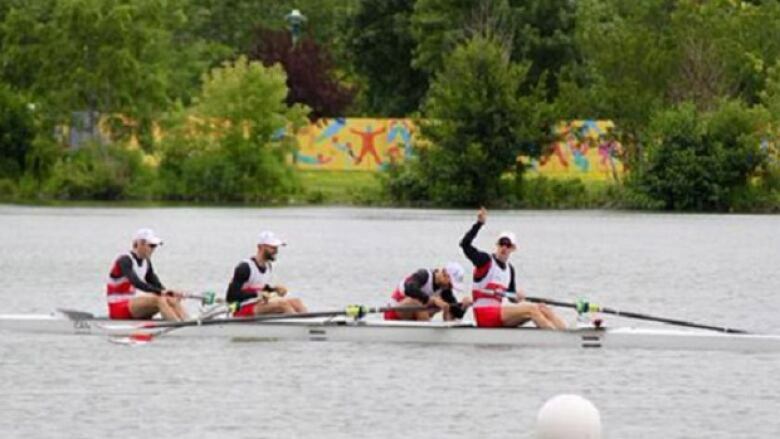 Canada won gold in men's lightweight coxless four and the men's eight final at the Pan Am Games on Wednesday. In the single sculls event, Rob Gibson earned a silver medal. There was more hardware for Canada's rowers at the Pan Am Games today. The men's lightweight coxless four captured gold, as did the men's eight team, while Rob Gibson of Kingston, Ont., earned silver in the men's single sculls. The results pushed Canada's rowing total at the Games to 11 — eight gold, one silver and two bronze. Maxwell Lattimer of Delta, B.C., Brendan Hodge of South Delta, B.C., Nicolas Pratt of Kingston and Eric Woelfl of St. Catharines, Ont., won the lightweight event in 6:42.40, more than four seconds ahead of the U.S. Chile was third. Canada's men's eight crew led from start to finish, winning with a time of 6:07.01 Argentina won silver in 6:10.08 and the United States won bronze in 6:12.64. In the single sculls, Cuba's Angel Fournier finished more than six seconds ahead of the pack to win gold in 7:51.39. Gibson was second with a time of 7:57.94. Brian Rosso of Argentina won bronze.